Based on our research across more than 20 countries, McKinsey.org is working to find solutions that will put all waste to productive use, for the benefit of communities and the environment. Our aim is to demonstrate that a community-scale solution that captures the full value of all waste streams and addresses all stages of the waste and recycling lifecycle—from the communities who generate the waste to the companies committed to buying recycled materials—can be economically self-sufficient, environmentally and socially responsible. Shannon Bouton (second from left) spoke at Our Ocean conference in Bali, Indonesia, including a panel discussion about ocean plastic hosted by Circulate Capital. “Today only a small proportion of waste is recovered for productive use. Recycling is stuck in a vicious cycle of unreliable demand and poor supply,” explains Shannon Bouton, McKinsey.org’s Global Execute Director, Sustainable Communities. 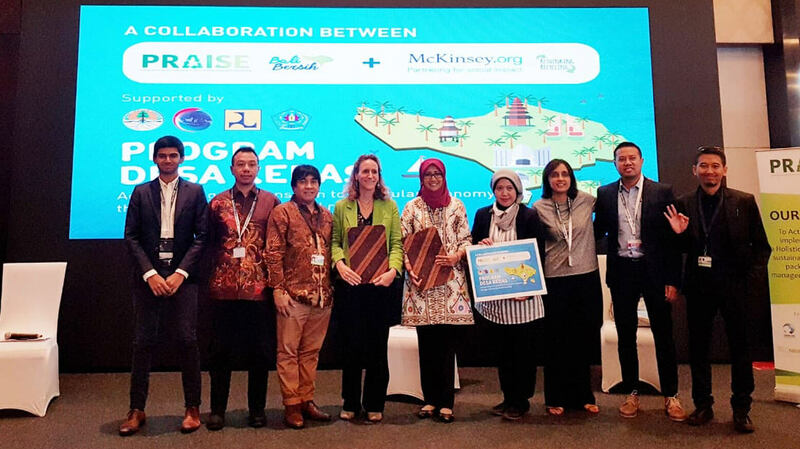 McKinsey.org will partner with PRAISE in Indonesia. PRAISE, the Packaging and Recycling Association for Indonesia Sustainable Environment, established its Bali BERSIH (“Clean Bali”) initiative to increase waste collection and minimize leakage into the oceans, targeting Bali’s coastal areas. Our work together will include optimizing waste collection, for example by educating households about waste separation, improving the efficiency of TPS3R sorting facilities, through training and incentivization, and securing demand, by working with companies who have committed to use recycled materials. We will draw on best practices from across Indonesia and the world, including Bali’s many success stories, and incorporate learnings into a full-systems approach. Both organizations hold core a belief that partnership and collaboration, including with local communities, government, nonprofits and companies, will be critical to success. “We’re delighted to be building a partnership with McKinsey.org to improve capacity in waste management through studies, education, and wider stakeholder collaboration,” says Sinta Kaniawati, President of PRAISE. “We believe this collaboration with McKinsey.org will multiply the impact of our initiative, Bali BERSIH, to help to solve the waste issue”. The first, pilot project, Desa Kedas (“Clean Village/Community”), will be launched in one desa in the city of Denpasar, with the intention that this will be scaled across the city, Southern Bali and beyond.